Brisket is at almost every BBQ eatery in Texas. 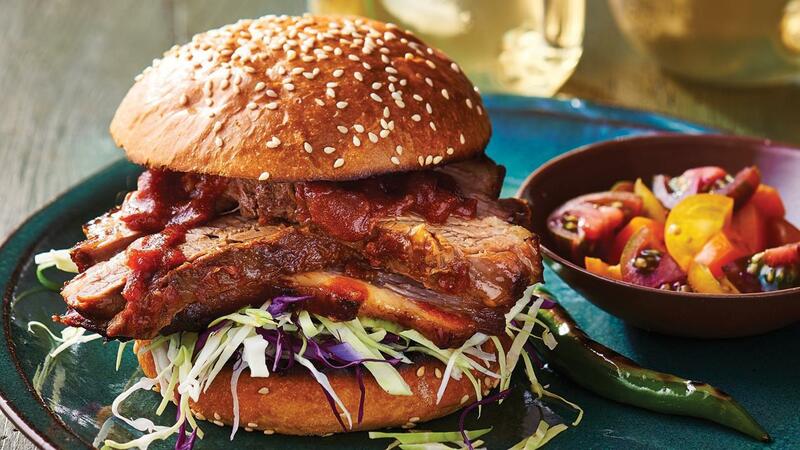 Offer this slow roasted smoky beef brisket served on brioche bun, with slaw and chipotle bourbon sauce on your menu and it is sure to be a hit. Mix all of the ingredients into a sauce for brisket marination. Marinate over the brisket for 12hours in the chiller. Slow roast in the oven at 150ᵒC for 1 hour until tender. Remove, rest and slice meat. In a sauce pot, mix all ingredients and bring to the boil. Spread the bun with Planta Chef Margarine. Toast it in a hot plate to bring up aroma. Slice white and purple cabbage thinly. Toss with Lady's Choice Real Mayonnaise. Place Lady's Choice Real Mayonnaise, top with slaw, brisket and bbq chipotle sauce.